Having not grown up in the US, I never really got the opportunity to study the American Revoluation like most high school students. In fact, until I took a class on it in college, I hardly knew anything about it. I mean, I recognized the name Paul Revere, and knew some of the major political players, but that was it. However, when my ship pulled into Boston for the 4th of July a few years ago, I got to do the geeky historical thing and go and see all the key sites of events that occurred during the initial stages of the American Revolution. 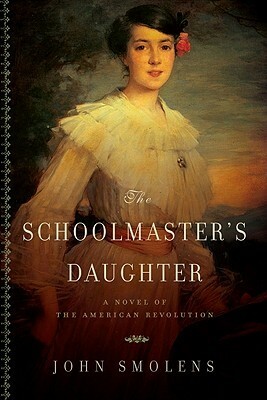 So knowing all this, when I started The Schoolmaster’s Daughter, I had a good idea of the key events as they occurred. I felt that the author did a good job of exploring the various dynamics that were occurring during this time period. The families that were split between being Tories and Whig’s (like Abigail/her brothers and her father/mother), the interaction of the British troops with the general population and the overall climate that one would expect in a country soon to be consumed by war. While I didn’t necessarily agree with all of Abigails actions, and felt that she def. had some TSTL moments, as a character she was engaging and I would like to see her maybe show up in another book that takes place after the revolution. The audiobook version of this was narrated by Elisabeth S. Rodgers. This isn’t the first time that I had listened to something narrated by her and it won’t be the last. She does a great job of being able to provide voices to a wide variety of characters and at no time did I feel like the voices were starting to blend together. At times, I wanted to continue driving just so I could listen to a bit more before I got to work or at home at night. Sounds like an interesting book. I love the cover! Glad you enjoyed it!